History Lives at Handsell ! to the “Restore Handsell” project! The NHPA was formed in 2005 to purchase and restore one of Dorchester County, Maryland’s most interesting and intriguing historic structures, an old ivy-covered brick building located in the middle of what is known as “the Indiantown”. After just a little bit of research, we knew we were on to something BIG. As the layers of the story unfolded, through research in archives, deeds, Wills and historic family letters, a better yet not fully complete story emerged of Native people, licensed Indian traders, English settlers, British attacks, merchant activity and structural devastation. Much of the Handsell story is STILL a mystery, but it seems each day brings a little more light to this amazing, yet previously unknown saga of the Steele family’s mark on the Eastern Shore. There is much here to learn about and see. So please stay awhile, explore our pages and get to know us! Handsell pictured February 2019 with all windows installed. 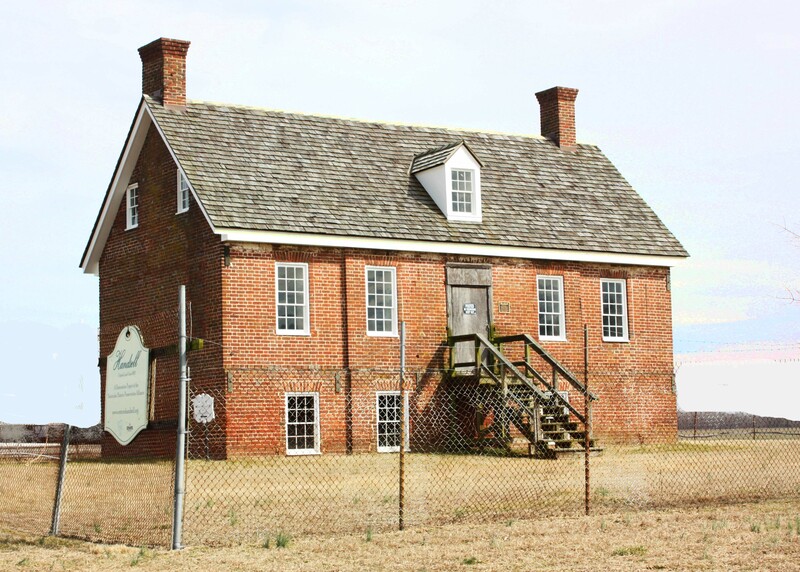 The “old brick house” at Chicone, known as Handsell, located in the Indiantown north of Vienna, Dorchester County, Maryland, was purchased by the Nanticoke Historic Preservation Alliance with a Preservation Easement from the Maryland Historic Trust. Listed on the National Register of Historic Places in 2008, the site will be used to interpret the native American contact period with the English, the slave and later African American story and the life of all those who lived at Handsell. 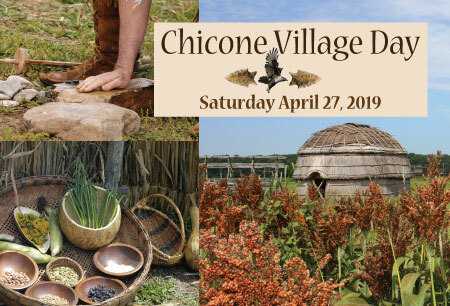 Make your own Tobacco Basket at Chicone Village Day and help with the continued restoration of Handsell. 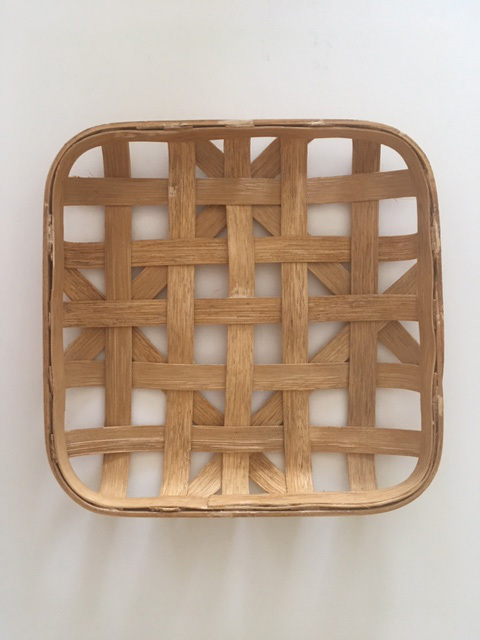 Only 10 spots available with all supplies and instruction provided by the Center for Research in Basketry, a non-profit funded by the Maryland State Arts Council. First time ever at Handsell. Space is first-come-first-serve, so REGISTER for BASKET WORKSHOP below using PayPal or credit card! Please email restorehandsell@gmail.com with questions. 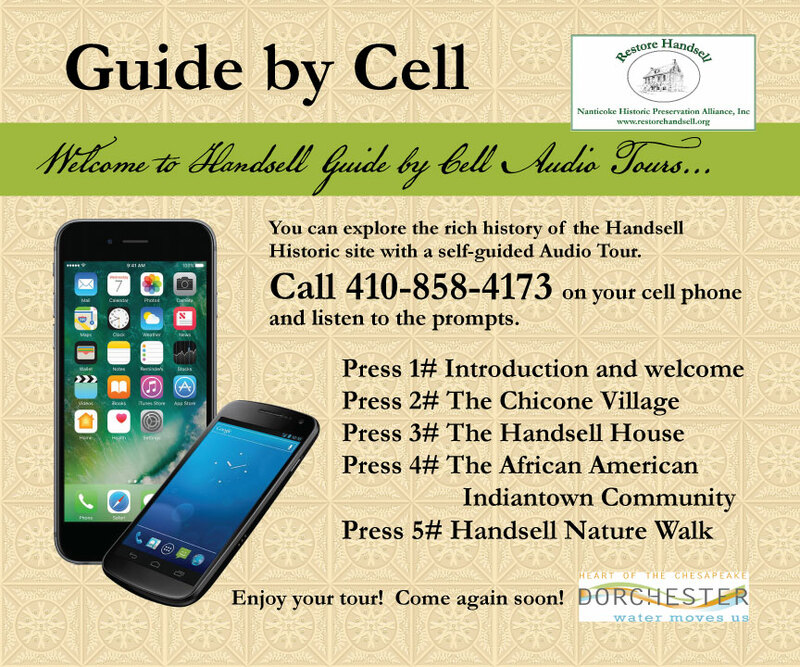 We are now offering Guide by Cell Audio Tours of the Handsell Historic Site to enhance the visitor’s experience. You may also dial this number from your cell phone from anywhere to learn more about this important National Register of Historic Places listed site. Also in 2018, Handsell has been added to Geochache!! ** Fall 2017 NHPA receives grants from Mid-Shore Community Foundation ($10,000) and Preservation Maryland ($8,000) for the Handsell Window Project. Windows expected to be completed by end of 2018. **September 2015 NHPA receives a $25,000 matching grant from the National Trust for Historic Preservation, Bartus Trew Providence Fund for a total of $50,000 work on a new cedar shake roof, dormers and roof trims. Work completed. 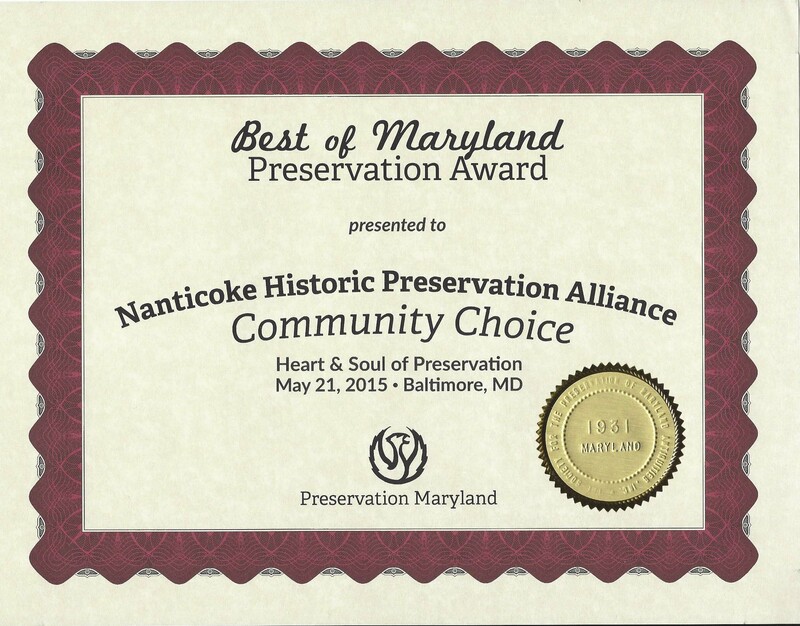 **The Handsell Site and the Nanticoke Historic Preservation Alliance has been honored by Preservation Maryland with the 2015 “Community Choice” Award. 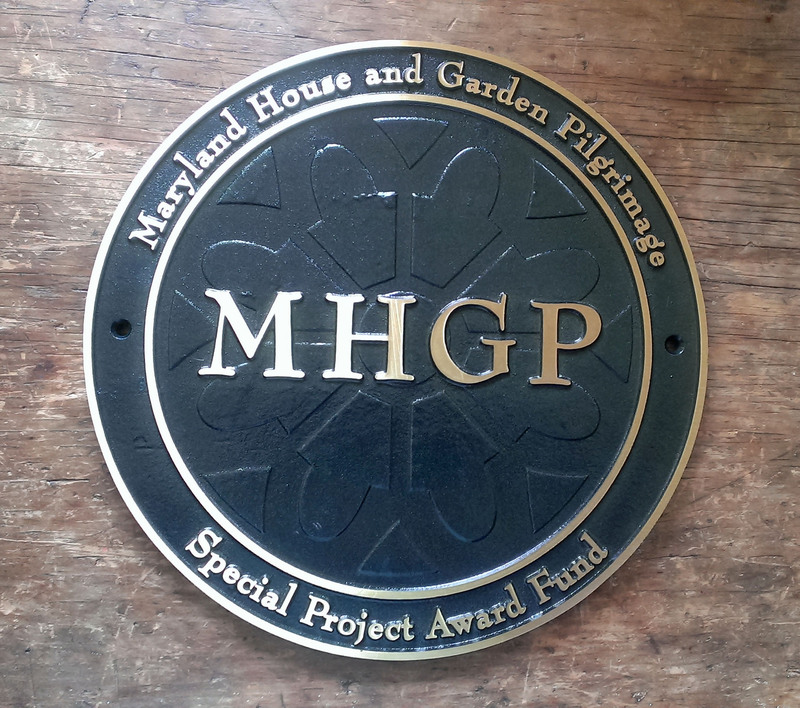 **In May 2015, the Handsell project received the “Special Projects Award” and $1000 from the Maryland House and Garden Pilgrimage! This is the SECOND time NHPA has been given this honor! Congratulations to all our hard-working volunteers! HANDSELL HOURS: Grounds are open to the public 7 days a week during daylight hours with Wayside Exhibits, Longhouse Living History Exhibit and Exterior Viewing of the Handsell House. Special Group Tours by appointment, contact restorehandsell@gmail.com During Restoration Phase, Handsell House is open for special events only: Chicone Village Day and the Nanticoke River Jamboree and private group tours. In 1665, Thomas Taylor was granted 700 acres of Land called “Handsell” along the Nanticoke River in the location of Chicone Indian town. In 1704 this land was made part of an Indian reservation by an Act of the Maryland Assembly. In 1769 the properties were returned to the ownership of the English families who had possessed the land grants. Handsell is one of the last remaining 18th c. brick dwelling houses in Dorchester Co. Originally a grand, two story Georgian home, a major event, possibly a fire at Handsell gutted much of the interior and weakened the rear exterior wall, causing a partial collapse of the structure. After a fire, Handsell was rebuilt to the one and one-half story structure we see today. The interior woodwork is all original to the period of the rebuild in 1837 by John Shehee, a local farmer. This brick dwelling house exhibits a unique façade with a protruding pavilion and Flemish bond brickwork, indicating the builder’s knowledge of contemporary design trends. Handsell is listed on the State and National Register of Historic Places!!! A more complete history of Handsell.